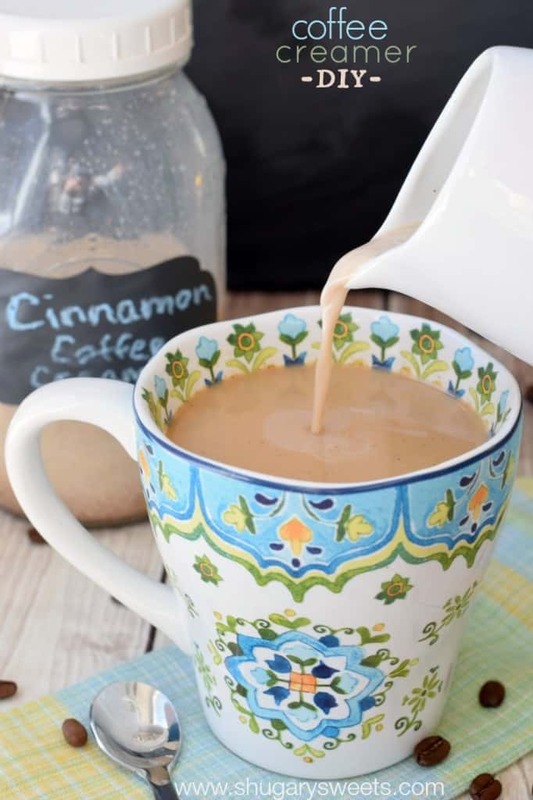 If you love creamer in your coffee…you’re going to LOVE how easy this Cinnamon Coffee Creamer is to make at home! 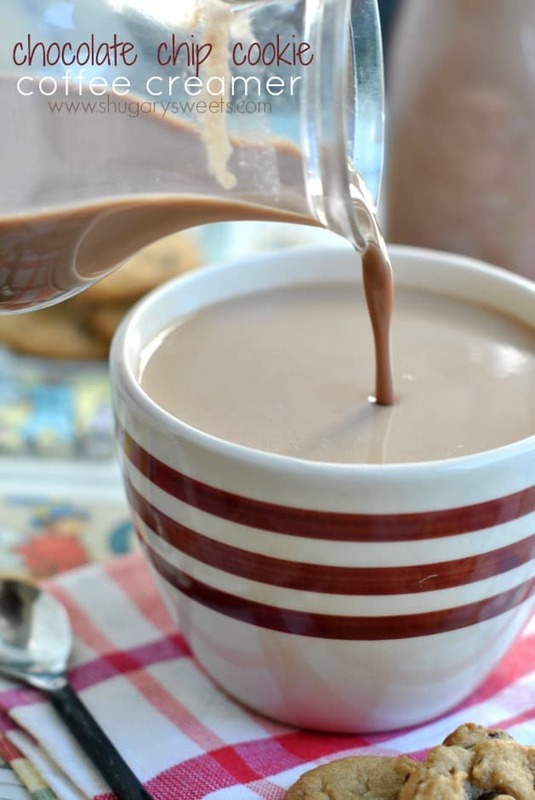 It was only a matter of time before I made this popular creamer recipe for the blog! There are so many great ways to enjoy cinnamon in your coffee. Some people add it to their coffee grounds. Some people add a cinnamon stick to the pot. Me? 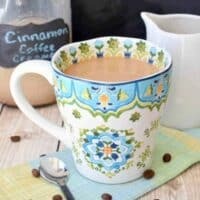 I make sweet Cinnamon Coffee Creamer! It’s no secret I am a coffee addict. In addition to my love of coffee…I love all the flavors of coffee creamers. At any given time I could have anywhere from one to half a dozen different flavors of creamers in my refrigerator. So creating my own version is not only easy, but cost effective too! In past recipes, I’ve used the stove top to help combine the brown sugar and seasonings to the milk. This helps the flavors combine evenly, no one wants a gritty creamer. Unfortunately, cinnamon is a bark. And it doesn’t combine very well. 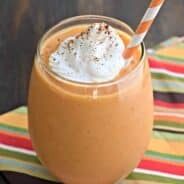 I tried several suggestions according to Google…including whisking the extracts with the cinnamon (supposedly the alcohol content helps dissolve the cinnamon). Well. It doesn’t work. At least it didn’t work for me. So….I still heat the seasonings and sugar with the milk on the stove top. I do this because you want to make sure your brown sugar dissolves completely. I store this creamer in a mason jar with a tight lid. That way I can give it a good shake before each serving, this helps evenly disperse all the cinnamon that inevitably falls to the bottom of the jar! One more secret? I used butter flavoring. It comes in a little bottle like vanilla extract and can be found on the same shelf in the grocery store. It takes this creamer to the next level. This isn’t just Cinnamon Coffee Creamer….nope. Now it’s Cinnamon ROLL coffee creamer. You’re welcome. 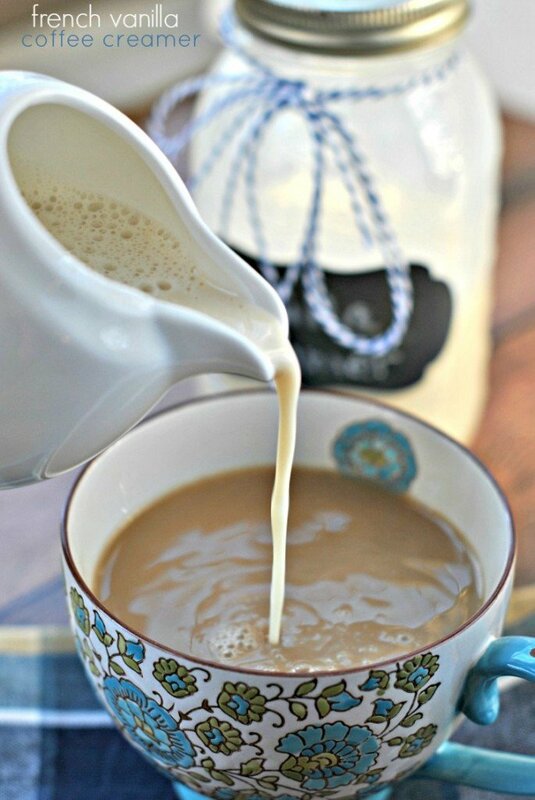 French Vanilla: a classic creamer recipe that everyone loves!! 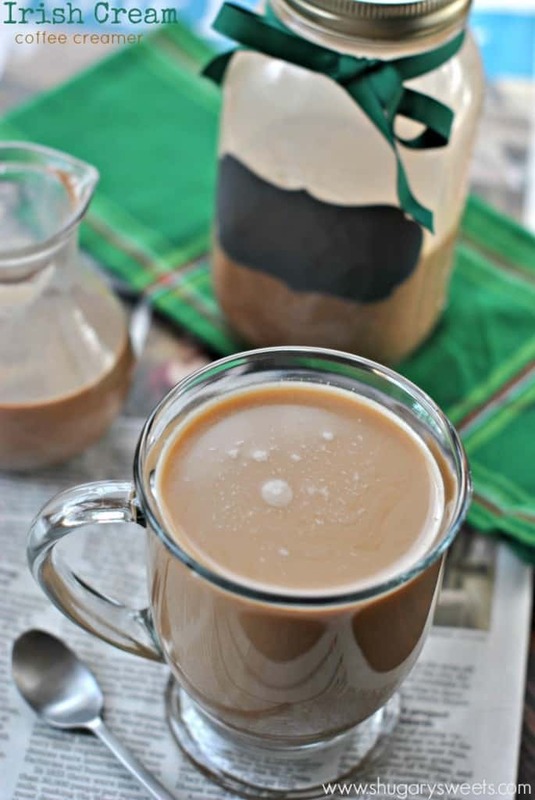 Irish Cream Coffee Creamer: this fun recipe is perfect for March! Chocolate Chip Cookie Creamer: oh my gosh, one taste and you’ll be hooked! 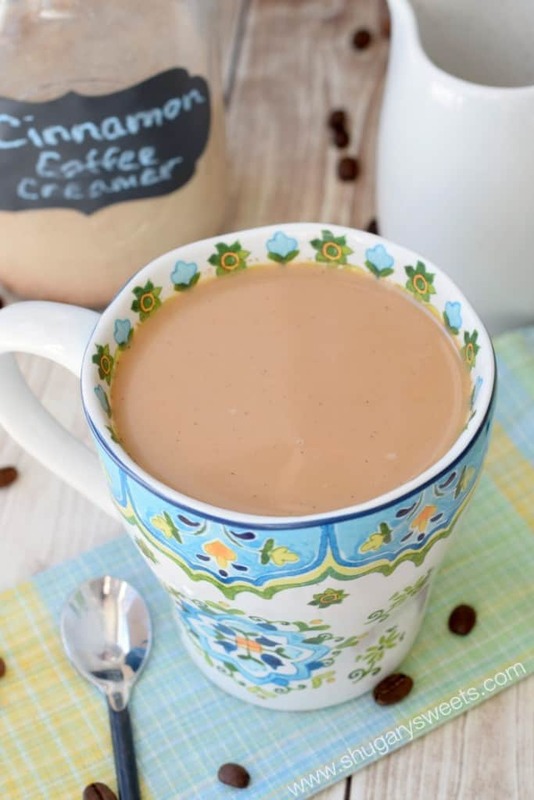 Homemade Cinnamon Coffee Creamer: so easy to make and you only need a couple of ingredients! In a small saucepan, combine milk, cinnamon and brown sugar over medium heat. Whisk continuously until sugar is dissolved. Whisk in the extracts and sweetened milk. Remove from heat and pour into a large quart sized mason jar. Refrigerate until ready to serve. Shake well before use. To determine the "use by" date, go off the date of your milk. It's best used before the milk expiration date. ENJOY! It was only a matter of time before another fabulous Shugary Sweets creamer was launched 🙂 Love cinnamon and this would be so good! I love flavored creamer. I bet this would be delicious in my coffee. I’ve always wanted to make this! 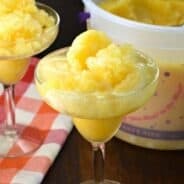 It seems so simple and I much prefer that I know the ingredient list! You don’t drink coffee??? I thought I said not to tell me that, LOL. It would make a delicious glaze…whisk in some powdered sugar and you’re set! Cinnamon and coffee is an amazing combination! Usually I use cinnamon when having an instant coffee, but here you gave a great recipe for the espresso :)) Thanks! I generally drink my coffee black, but this looks delicious! I love adding cinnamon into my coffee beans before grinding! This sounds so tasty! I love your mugs! I love coffee also but it has to have creamer! I’m like you, I often stock up on my favorite flavors and it can get expensive. I will have to try my hand at making my own! You make the best coffee creamers! I love the cinnamon flavor in my coffee! I am such a fan of coffee and I love this idea!!! Can’t wait to try it! Wow. I mean, this is amazing with coffee. And then if that coffee were accompanying, say, a cinnamon bun or crumb cake, you could then hide in a closet for a while and have a private moment. Love it ! You’re the coffee creamer queen! (Among other things, your sash is getting quite long!) What a great addition to a Valentine’s Day breakfast in bed! 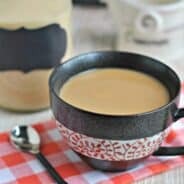 I love all your creamer recipes, especially this one. I’m a huge sucker for cinnamon anything! Hmmm agave…I just bought some, I need to play around with that to make some healthier creamer recipes!!! When you do, I will be the first to try them!! =) Just love your recipes! I have always wanted to make homemade creamer. This one looks so good. I tried this one and must say I’m disappointed 🙁 I love cinnamon and just couldn’t get it to dissolve, so sad! I love all your other coffee creamers, maybe it’s just a fluke! This looks wonderful. Thanks for sharing and please tell me where to get a cup like the one shown! Couldn’t a cinnamon stick be used? I’m thinking, if allowed to steep for a while, it might impart some flavor but way less grit. I think you’re right, it might work quite nicely! This has a bitter taste, too much cinnamon for me. Use Lactose Free milk to greatly extend the use by date. Ever tried freezing these into ice cube trays to extend the shelf life? In thinking just pop a couple out of the freezer when I have a cup of coffee. I love the idea of homemade creamer. Have you ever read the ingredients list on the store stuff?? yikes! I haven’t tried freezing them, but that sounds pretty awesome. If you do it, let me know how it turns out!! 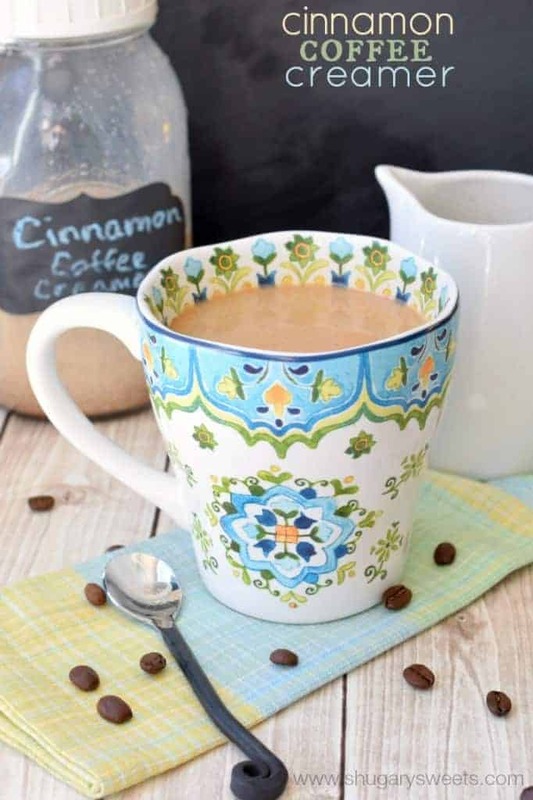 I would love to make these for the house as my daughter and I both are coffee fanatics, BUT she’s lactose intolerant! Do you know what I could substitute so I could make this? Thank you so much! This creamer sounds so delicious! I am one of those heathens who doesn’t like coffee, though, so I would maybe use it in a chai tea or, as someone else suggested, as a drizzle on coffee cake or something. Any idea how many calories is in a serving?? Just wonder trying to count them. I love the sound of your recipe. Put the cinnamon in your coffeemaker with a clean filter. Add .5 to 1cup water. Remove pot and hit start and let sit for a few min and then place the pot back and the filter will keep the cinnamon and give the flavor out into the water. Make it strong and then add to the milk to taste. I do this often for myself, but my husband doesn’t like the flavor! What percentage of milk did you use? This sounds delicious! You can use whatever you like. For a thinner, healthier version use skim. For a thicker creamer, use whole milk.